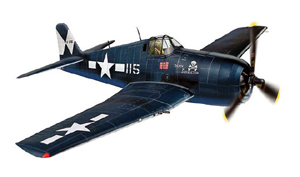 YellowAirplane.com: F6F Hellcat World War 2 Model Airplanes, Plastic Model Kits, Wood and Diecast Airplane Models. F6F Hellcat World War 2 Fighter Model Aircraft, Plastic Model Kits, Wood and Diecast Aircraft Models. Plastic & Diecast Model Aircraft. F6F Hellcat Aircraft Model Section. F6F Hellcat Collectable Plastic Models, Die Cast Models and Wood Model Kits, all with history notes of their World War 2 Combat Action, Now with Hobby Master Aircraft Models. All New F6F Hellcat Fighter Model Airplanes including the New Super Detailed, Hobby Master Diecast Airplanes. These planes come in Plastic Model Kits, Wood Model Kits, Diecast Models, Molded Resin and Mahogany Display Models. Also included on all of YellowAirplane's pages are History Study Notes for anyone doing studies on World War 2 or Aviation Technology. The Grumman Hellcat was designed from the beginning to take back the skies over the Pacific from the Japanese Zero. Though not as maneuverable as the smaller Zero, the Hellcat's speed and firepower usually won the day. Successor to the Grumman Wildcat, the F6F Hellcat made history in 1942 when it decisively whipped the Japanese carrier based fighters opposing it in the Pacific during WWII. In addition to its duty as a aircraft carrier-based fighter, the Hellcat served with the U.S. Marine Corps as a potent fighter-bomber. Look at this link for the Most Fantastic Adventure On EARTH. F6F Hellcat WWII Fighter Models. Often referred to as the F4F Wildcat's "big brother," the Grumman F6F Hellcat was the most successful aircraft in naval history, destroying 5,271 enemy aircraft while serving with the U.S. Navy and Marine Corps. A replica of the -5N variant of the F6F (outfitted with radar for night fighting), this 1/48 scale, plastic kit features a well-equipped cockpit with a glazed canopy; a multi-part R-2800 Double Wasp radial engine; optional-position folding wings (with interior details when folded) with separate parts for control surfaces; a wingtip radar fairing, six HVAR rockets, and two 1,000 lb bombs; intricate landing gear; a choice of VMF(N)-541 "Bat-Eye" or VF(N)-107 markings; and more. 10" wingspan; 121 parts, assembly required. an F8F-1 Bearcat - Grumman's final piston engine fighter, which was intended as a replacement for the F6F Hellcat - this 1/32 scale plastic kit features textured surfaces, a clear engine cowling, photo-etched detail parts, an external fuel tank, detailed landing gear with real rubber tires, a choice of U.S. Navy markings including those of CVG-19 stationed on the USS Boxer (CV-21) in 1950, and more. 13" wingspan; 366 parts, assembly required. 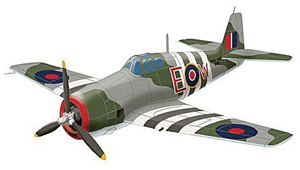 This 1/32 scale, plastic kit features a detailed cockpit with an optional-position canopy and a pilot figure, a realistic Pratt & Whitney R-2800-10 engine, optional-position wing flaps, removable machine gun bay panels, HVAR rockets and a centerline fuel tank, intricate wheel wells and landing gear, and a choice of three markings (VF-17; "Minsi III" of David McCampbell, VF-15; and Royal Navy Fleet Air Arm No. 300 Squadron). 15" wingspan; 97 parts, assembly required. Tony Weddel. David McCampbell shoots down nine Japanese aircraft over the Philippines on October 24, 1944, an action for which McCampbell was awarded the Medal of Honor. Introduced in 1944, the upgraded N1K2-J evenly matched the F6F Hellcat and held its own even against Allied greats such as the F4U Corsair and P-51 Mustang. an N1K2-J "George" flown by 48-victory ace Lt. Naoshi Kanno of the elite 343 Kokutai. Introduced in 1943, the Grumman F6F Hellcat went on to destroy 5,271 enemy aircraft during World War II, more than any other Allied fighter. "White 1," the F6F-5 Hellcat flown from the USS Princeton (CVL-23) by 7-victory ace Lt. Cdr. Fred A. Bardshar of VF-27 during the "Marianas Turkey Shoot" of 1944. The F6F-3 Hellcat flown by 6-victory ace Ed "Wendy" Wendorf of the VF-16 "Airedales,"
Successor to the Grumman Wildcat, the F6F Hellcat made history in 1942 when it decisively whipped the Japanese carrier based fighters opposing it in the Pacific during WWII. In addition to its duty as a carrier-based fighter, the Hellcat served with the U.S. Marine Corps as a potent fighter-bomber.